Soon after I came here [in 1856] I remember hearing the men folks tell about a robbery just across Butte creek, about six miles south of here — at the first little creek that you cross beyond the present Butte creek bridge. The name of that creek is Robbers’ creek today because of this robbery. The highwaymen got away with a big quantity of gold, $5000 I think. Another robbery took place right in front of where now stands Canfield’s wagon shop in Main street. Here the robbers made a good haul and for many years it was supposed that they buried their loot beneath a huge oak tree which stood there. Diligent search, however, failed to disclose it. Everybody was a peace officer in those days when it came to anyone breaking the law of man. They very seldom caught these stage robbers and the only way to catch them at all was to shoot them on the spot. They killed two north of Keefer’s ranch. 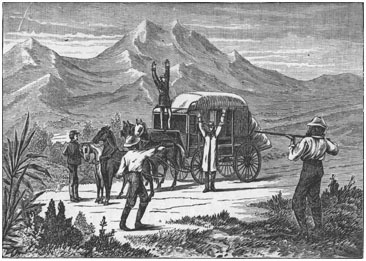 According to Cheryl Anne Stapp, in her book The Stagecoach in Northern California, the first holdup of a moving stagecoach in California happened in 1856 near Marysville. Robberies increased steadily through the 1860s, reaching a peak in the ’70s and ’80s. I searched the California Digital Newspaper Collection for information about the stagecoach robberies that D. F. Crowder describes. It’s hard to know, but here is one that might be a match. It appeared in the Sacramento Daily Union on June 11, 1860. ROBBERY OF WELLS. FARGO, AND CO. — On Saturday night, June 9th, about nine o’clock, as the Shasta stage from Marysville arrived at a gulch about seven miles below Chico, five men rose up from the gulch, where they had beep secreted, and leveling their guns at the driver, and Bowen, the Express Messenger, ordered them to stop. Bowen instantly grasped his pistol, but finding it was useless to resist, surrendered. One of the gang unhitched the horses, while another took the treasure box, and demanding the key of Bowen, opened it and extracted $15,000, with the remark that the company was rich, and his party had particular use for the money. This done, they hitched on the horses, and permitted the stage to proceed. As the stage started, some passenger gave the robbers four charges from a revolver, but does not know if they took effect. Bowen has returned with his party to Chico, without finding any clue to his treasure or the robbers. Bowen, James Y. McDuffie, and a lady, were the only passengers. A reward of $7,000 has been offered by Wells, Fargo & Co. for the recovery of the treasure, and $5,000 for the conviction of the robbers. This entry was posted in Stagecoaches. Bookmark the permalink.